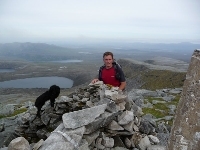 Ben Hope, the most northerly Munro, has wonderfully steep and craggy W and N slopes. The E slopes whilst less steep in places are craggy and boulder strewn, and extended to form four ridges which create three corries, each with its own lochan. To the S, however, the the slopes are mostly gentle therefore the ascent of this rugged mountain can be easy. 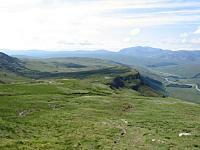 The easy ascent route is from Alltnacaillich to the W onto the escarpment, the Leitir Mhuiseil, above the Strathmore River, from where easy slopes lead to the summit overlooking the craggy N slopes. A more challenging approach can be had from the Moine Path on the crest of the most northerly of the E ridges. Sunset over Ben Hope, whilst camping on Sail Romascaig. 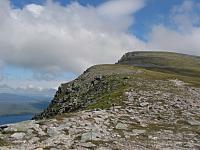 The south ridge Leitir Mhuiseil from Ben Hope. 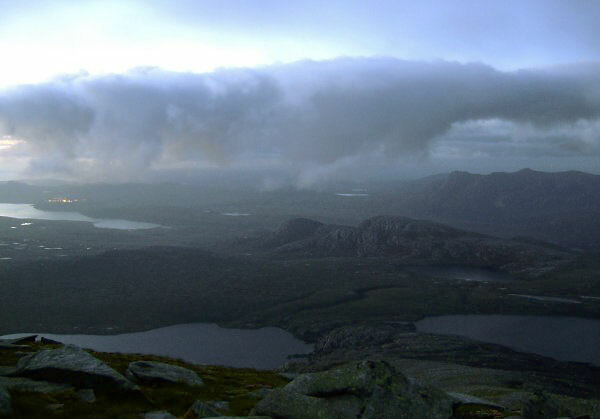 View NE from the top of Ben Hope taken at 2am on 24.6.08 - a few days after the solstice on an unlit night walk to the summit. Waiting for the sun to rise. 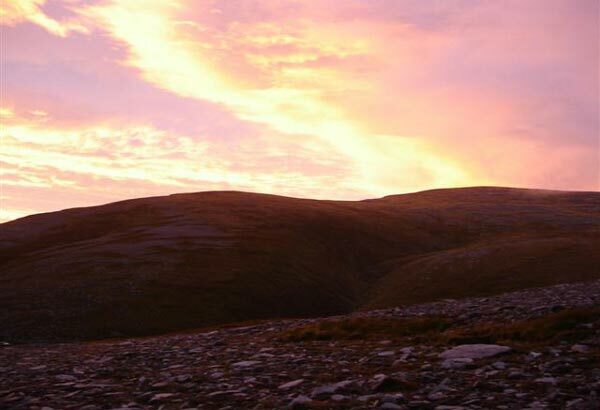 The summary information of one or more ascent routes that include Ben Hope. 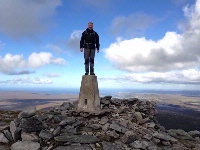 1 934 m 11.67 km 4 hrs Ben Hope Short route with ascent through crags, but little scrambling required. Roy and John alone on a busy top. Post a few words about Ben Hope or read what others have had to say. ... which is a nuisance, because the path with the sign at the bottom is the most impassable quagmire in the solar system! At the start of the recommended route (Alltnacaillich) there is a sign saying the best parking and route lies farther north at the big barn,this is where the sign is saying way up ben hope. Someone obviously doesnt want walkers starting near the small holdings!! 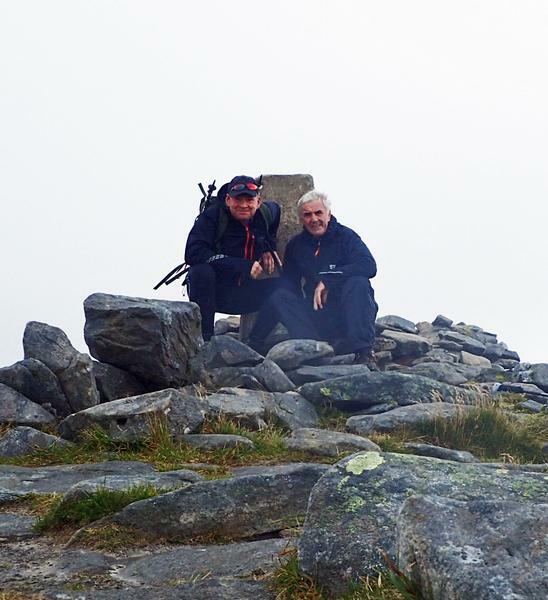 Climbed Ben Hope on Saturday the 22nd Sept in horrible conditions. The only reason we went up was to accompany Brian who was finishing his round of the Munros. The rain had turned the path into a river and the hillside was a mud bath. However all this was irrelevant when we reached the top and the celebrations began. Well done Brian. Judging by the size of the parking space, the sign "way up Ben Hope" and the well trodden path, then a lot of people are starting from the "big barn" at NC 46204765, and not from the longer route recommended above. Did the round trip with a break at the top in 4 hrs, although unfortunately the top was in cloud. Climbed this yesterday. The path tends to go straight up so no easy zig-zag! Easy to navigate but don't rely on path as the boggy ground tends to make it disappear in places. With most hills it could be misleading coming off if the cloud base is low which came down on us! but only lasted a few minutes. View was a bit cloudy at top still could see the north sea - It was freezing at top - needed hat and gloves - can't imagine what its like in winter. I think the narrow single track road leading up was harder to guage than the hill itself lol! Good parking though.